In the Hall 7 of the workshop at the College of Engineering, busy movements of the students can be seen. The lights are on in the morning, afternoon, evening, and even early morning and those who are preoccupied with busy movement are the members of the automobile club, ‘KORA.’ With enthusiastic desire to make a vehicle, the passionate students are willing to do intense labor. 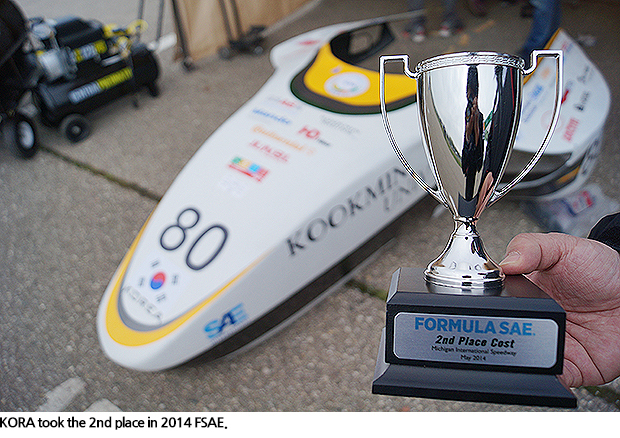 In the Formula Society of Automotive Engineers (FSAE) that is held every year, KORA surprised the world by securing the top 10 in the Formula Society of Automotive Engineers (FSAE) for 2 consecutive years in 2009 and 2010 defeating world-renowned engineering colleges from automobile powers like U.S., Germany, and Japan. 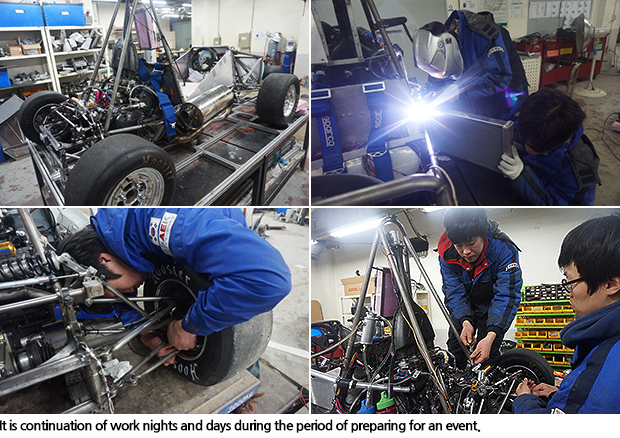 Although it seemed to encounter stagnation, KORA secured the 18th spot in FSAE based on consistent effort and now, it is targeting to become the best in the world. As if a driver who made a temporary stop at a red light, it accelerates again with a green light to spring higher. What is the prime motor of their efforts and challenging spirit despite the hardships? Let’s listen to their stories. As its name suggests, it is a vehicle-oriented club that belonged to the Department of Automotive Engineering in Kookmin University. Based on the principles on automobile or theories learned in the course, we design a car and by deciding its practicality through program-oriented interpretation, a car is produced to compete in a racing event. It is not just to make a car for racing in a competition but to come up with a presentation on design knowledge or production cost for a car. Also, we have a presentation as to what strategy is to be implemented when our car is commercialized before competing in a race. Series of such courses can be seen following the mechanism of the actual automobile industry. 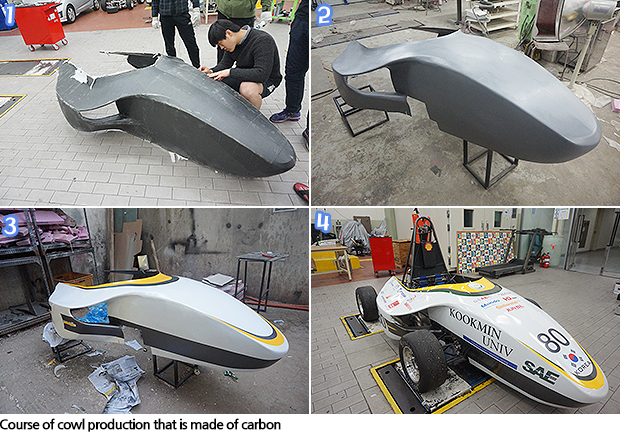 How does ‘KORA’ prepare for an automobile competition? In order to make a complete car, at least 20 up to 30 ~ 40 people work together. Centering the ‘Front Manager,’ parts like chassis, brake, transmission, suspension, engine, and frame for a car are divided to make a team. 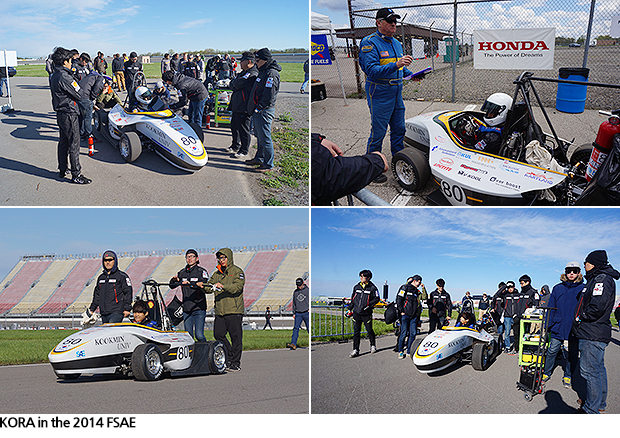 Based on each team, the part managers educate freshmen on a variety of knowledge to make a car. Sometimes, part managers of a previous racing competition transfer overall matters to the team managers of this year’s competition to prepare for the event. Explain how to make a vehicle. Once an event to challenge is decided and the course of the event is announced by the host, analysis on the event and course is primarily made. Then, the concept of a car is decided. For example, various matters whether to make a car that stressed importance in the aspect of aerodynamics or one that focused on suspension are decided through several times of meeting. According to the decision made, parts are decided and design starts based on the concept. In general, design is progressed through 3D programming like CATIA and through such design, completed parts are gathered to form a car. After evaluating the practical functionality of this vehicle, this car is actually produced. What aspect did you pay most attention to while making a car for this event? What we stressed most importance to was on the endurance race. In other words, it is the evaluation as to whether a car can still run after about 1 hour of driving. It is an important race that takes 300 points out of a total score of 1,000 while racing for 22km of long and complicated course. The dynamic event is composed of 4 kinds, namely, acceleration, skid pad, autocross, and endurance race and except for the endurance race, the other 3 races are for a single trial. For example it you measure the time taken for 75m, it requires a single trial race but owing to the nature of a race car, it is difficult to confirm if it can run for 24 hours. Somehow, the world’s no. 1 cannot be relieved in the race. That’s why we devoted efforts for several years. What is the reason for resulting in low rank in the FASE after 2010? Actually, the reason of the falling rank was due to the car that failed to stand the endurance race as explained before. Our car was unable to run for 3 consecutive years in 2011, 2012, and 2013. This race is really challenging as such quality was not tested through many cars. So it is the struggle as to how perfect a car can be made at once. Because of this, 1/3 of a car is unable to run in this race. For the past 3 years, we encountered repeated failures due to different reasons but after 4 years of trials and errors, we finally completed the race. All of our cars were not slow; nonetheless, all failed to complete this endurance race and it resulted in falling from our rank. As our car completed the rank this time, we regained our status up to a certain level although there is still to plenty of room for improvement. What did you feel after the previous event? We never thought that cars in low rank were poorly made cars. Rather, we thought they were different cars. The team that prepared in the previous event does not consistently prepare for the next event but a newly organized team prepares for a new event. Therefore, the members want more challenge and advanced car compared to the one that raced in the previous event. Although the previous team established more stable system, the members want to create a new car according to their concept through slight changes. It is the pride of the designers. So we are not sorry for rank fluctuation caused by the change made in the car. Maybe there was increased possibility of securing higher rank if we made the exactly the same car. However, the new members with new parts made the best use of their ability for their car so the rank was the result of what they did. Since the members prepared by devoting time for 7 ~ 8 months, they are very satisfied with their car. Of course, it was good to have better rank but real happiness comes from the race of the car they made. The flare to regain better score was fired in the event. What is the prime motor? The biggest objective of the car this time was one that could stand racing for a long period of time since there were different reasons of failing in the endurance race in the past 3 years. Another problem arises after solving one problem and then another problem occurred. Thus, we were able to understand the reasons of the failure that we encountered. 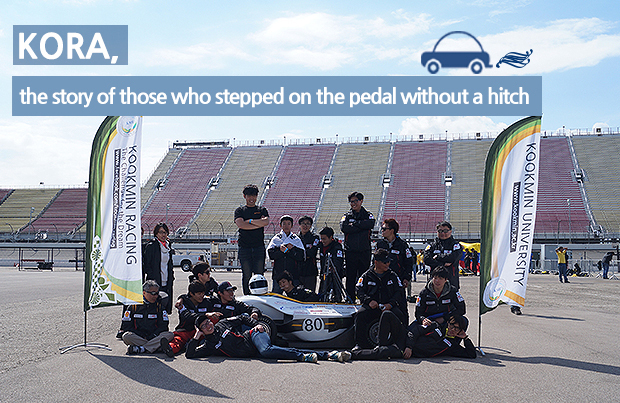 Through such experience, we found the knowhow to prevent the state that failed the race of a car. Meanwhile, we could trace the pattern of a stable car. Maybe it is not the prime motor, but accumulated experience through trial and error was the reason of our improvement. By developing other technologies based on such knowhow, we will obtain higher rank. What was the most difficult thing while preparing for the event? We barely had private time. For several months after starting the work, we come to the lab from 9a.m. to 1p.m. There is no concept of private time. It is not harsh at the start of preparing for an event but as time goes by, we cannot even think about some doing something private. Since we are rushed by the fixed schedule to produce a car, we work when waking up in the morning. So the members that prepared for an event take a leave of absence. The team prepared for this event in the U.S. did not have a day-off from the middle of February until the end of the event. Someone even broke up with his girlfriend and had problems in their private plans. Why do you keep working despite such difficulties? This is something I really want to do from deep inside of my mind. It is terrible to do something we don’t like. It is fun to do what I want to do. Of course, it is very hard although I love to do it. There are times I regret but after completing an event, I start to think of challenging again. It is difficult yet fun at the same time. Also, there is also a sense of responsibility. Everyone works hard so if I leave them behind, it would cause a lot of trouble. Those with more important position have stronger sense of responsibility. That’s why we work hard, even neglecting sleep. We are excited about what we do with a sense of responsibility. As leader of the club, what are you most grateful for to your club members? As a leader, I expect the members to follow the grand picture and path for the overall operation of the club. As you know, there are many things we manage so it requires the devotion of each member’s private time. From the members’ perspective, they can earn money, have another hobby, or do something for self-development. So I am very grateful for their devotion and trust on me by giving up what they have to do. There are many challenging things but I am thankful for them when they do not show the pain of such hardships. It is part that makes the members cheer the most, and I am so grateful for my members and car made by us as it makes its first run. I have mixed emotions. How do you feel about the domestic event to be held in August? 4 teams will compete in this event. Although we don’t have big sense of rivalry, I hope that all 4 teams will have the best result in the event. We all will try hard to achieve the best outcome through fair competition that can help each other. I look forward to your support and interest. There is still more to go to use the expression ‘resurrection’ for KORA. While having the interview, the members felt awkward when hearing such expression; however, the efforts that they have shown for the preparation of the next event deserved the expression, ‘the flare’ towards their resurrection. They were passionate and enjoyed even hardships with conviction and joyful spirit. No one can expect what to come since there are variables and all efforts devoted are not a guarantee towards positive outcomes. However anyone who witness the efforts made by the KORA members, will consider what they have devoted to achieve the result in the event. It is important for us to support and encourage KORA under any circumstances. Such will be the great strength to them as well as the mind to prepare for KORA.